What is the HydraFacial MD® (HydraFacial)? The HydraFacial is a gentle, non-invasive treatment that both soothes and moisturizes to produce remarkably clearer, glowing skin. It also happens to be one of the only hydradermabrasion procedures that simultaneously combines cleansing, exfoliation, extraction, product and antioxidant infusion, improving texture, congested and enlarged pores and oily or acne-prone skin. What makes the HydraFacial different at Seiler Skin? At Seiler Skin, our HydraFacial combines the best elements of a cosmetic procedure and spa-like experience. Through our consultation process, we are able to fully customize our approach to help each patient achieve their desired results. Our highly trained medical aestheticians are comfortable performing a thorough, results-driven HydraFacial, as opposed to a simple, traditional facial. We also only use HydraFacial-manufactured products, versus generic serums. Lastly, under the direction of Dr. Seiler, we will recommend medical-grade skincare products that will further optimize your results and enhance your treatment experience. Learn more HERE: What makes Seiler Skin’s HydraFacial so unique? What are the results of the HydraFacial? Men and women of all ages and skin types can see significant benefits and results from this treatment. 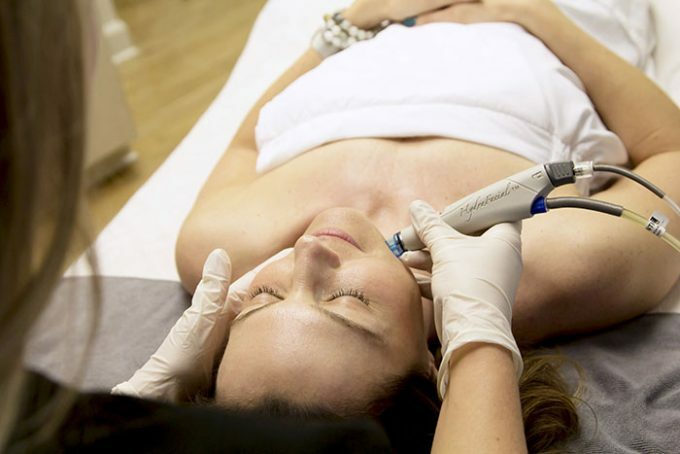 The HydraFacial can be used to treat the face, neck, chest, back and hands. What is the social downtime from a HydraFacial? There is no downtime from the HydraFacial. This is a great instant-gratification procedure for patients looking to brighten their skin and “get that glow!” After the HydraFacial, patients can immediately return to normal activities. How often can I come in for a HydraFacial? We typically recommend HydraFacials in routine intervals, normally four to eight weeks apart, to achieve and maintain desire results. What is the price of the HydraFacial? The HydraFacial at Seiler Skin is $160 (includes infusion of products and glycolic acid peel). We also offer HydraFacial packages. Watch a HydraFacial Treatment at Seiler Skin!